Developing a Lean Innovations culture requires a commitment from leadership to develop and implement a strategic vision answering the question "What Does Great Look Like?" Through what we call a "Partnership for Success", Leanovations provides much more than a set of lean tools and techniques to develop the culture. We develop an organization's way of thinking. The way they PLAN in everything they DO. How they CHECK their progress, and the ACTIONS they take. We call this the Plan-Do-Check-Act (PDCA) way of life. Leanovations also believes that Constant-Gentle-Pressure (CGP) is required for continuous improvements to be realized and we pride ourselves on providing CGP to our clients to ensure they stay on the path for success in their lean journey. Leanovations provides interactive teaching and coaching to identify core competencies and developmental areas and provide a rich environment of ongoing self-awareness, learning and support that provides sustained results. 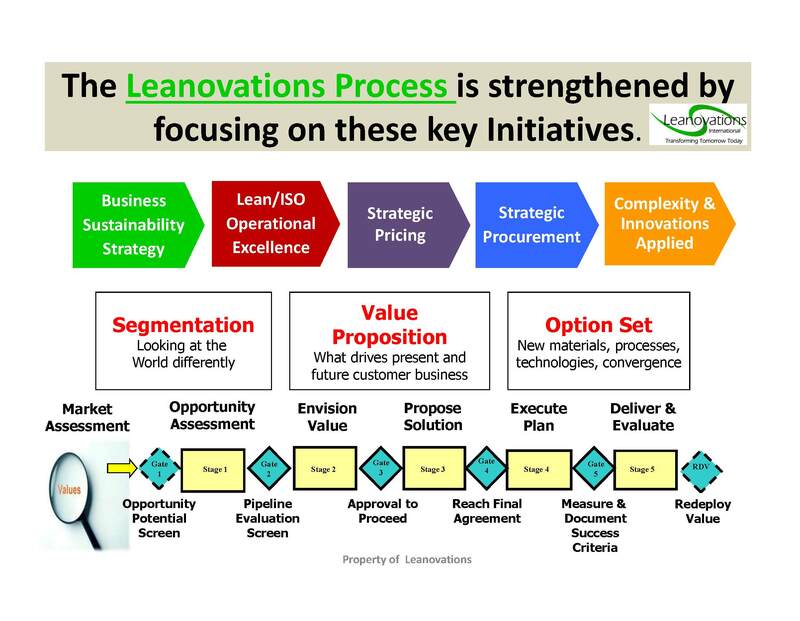 Leanovations expertise in teaching and coaching has been providing companies since 2006 with strategic planning and deployment, lean to green operational excellence, quality management systems, organizational culture improvements, sales growth through innovations, developing supply chain partnership and procurement initiatives to ensure profitable growth. We offer customized consulting and training, project management and interim management services, along with business assessments and executive leadership coaching. The following services our team provides are critical in applying an innovative approach to a Lean to Green culture. We lead our clients through these strategies as they pursue world class status. 1. Strategic Planning, Development & Deployment: Developing breakthrough objectives and annual improvement plans to reach your organizational short term and long term objectives and goals. 2. Lean to Green (L2G) Operational Performance and Business Sustainability: Improving L2G business performance, customer satisfaction and employee morale, translating into a new market reputation and competitive advantage. Utilizing Lean to Green (L2G) processes and Kaizen Team approach to develop organizational skills critical to achieving and sustaining gains and positively effecting the 3 P's of: People, Planet and Profits while meeting ISO 9001 and 14001 requirements. 3. Lean Leadership Development/Mentoring Through Continuous Improvement Kaizen Teams: Creating a favorable lean learning culture and environment where individuals are engaged and teams are respected, challenged and empowered to make a positive difference for the organization that supports the strategic plan and objectives. 4. ISO Integration/Quality Management Leadership: Leading an organization through a ISO Integration and Quality Management Leadership culture that meets requirements and focuses on continual improvement while integrating and embracing the Lean culture. Providing ongoing assistance with ISO Training, internal audits, process mapping, documentation development, and continuous improvements. 5. Sales and Operations Planning and Lean Supply Chain Partnerships: Business success must reach beyond the company's own boundaries and consider the market demand and planning along with the total supply chain services, aligning asset/capital responsibilities with market demand requirements. Establishing a strategic total enterprise value stream that increases market share and improve profits, by rapidly flowing information and material, reducing complexity, cost and inventories, through a total Value Analysis. 6. Customer Valued Innovation and New Products Introduction:Targeting smart growth innovation, with new products or services introduced, that customers value while controlling complexity. Allowing companies to reinvent themselves as the market and economic conditions change providing a means to continue profitable growth. 7. Business Complexity Rationalization: Analyzing and optimizing product and service offerings to reduce costs and organizational burdens that hinders an organizations ability to become world-class. Complexity sneaks into an organization over time and begins to creating clutter and confusion, hindering profits. 8. Executive Leadership Coaching (One on One): Businesses need leadership with expertise, experience, and an ability to engage others to execute continuous improvements. Great leaders do not work to develop good followers, instead they work hard to develop new leaders. 9. Business Assessment and M&A Due Diligence: One major opportunity for growth for any organization is through mergers and acquistions that complements the organizations strategic plan. Conducting a Business assessment and conducting due diligence is critical to organizational and financial success. 10. Interim Turnaround Management Assignment and Services: At times businesses may need short-term support to manage, lead and help with a turnaround initiative to meet the companies goals and objectives. Implementing an assignment from the outside organization, helps navigate and execute a plan in a necessary time-frame, in concert with the owners/executive team can be more effective in achieving necessary results. 12. Lean Communications and Video Production: Producing the visual artistry of telling an overall story into a continuous and enjoyable film utilizing those skills and experiences from the owners, leadership and employees that personalize a company’s Lean Journey. 13. ERP (Enterprise Resource Planning) Selection and Implementation Support: Identifying and implementing the proper integration of an ERP computer systems with Lean practices is critical in supporting the total enterprise, providing clients sustained results, while keeping the business core competencies, and maximizing the effectiveness of the software in support of Lean to Green. 15. Lean Government (State and Federal): Having Government agencies embrace Lean has real promise and a chance to radically reshape how the government and the business community prosper together, where they work together for a common cause of “Reinventing Government” with an agenda for action on creating jobs.